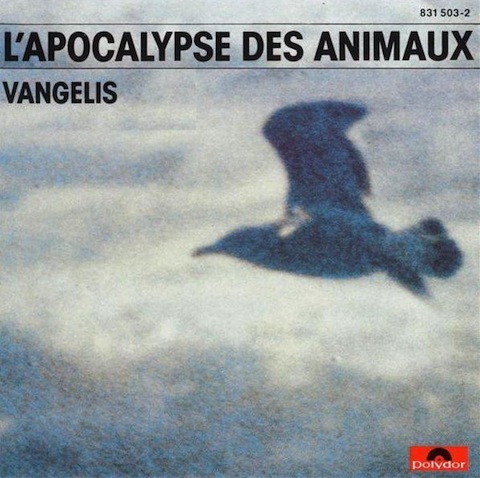 L'Apocalypse des animaux by Vangelis is the 293rd Soundtrack of the Week. If you only know Vangelis because of the theme from Chariots of Fire, then this beautiful, gentle and lyrical work may take you by surprise. The main title theme has steel drum-like sounds creating a killer groove, which leads into some lush synth textures. This is followed by the heart-breakingly lovely "La petite fille de la mer", a delicate and gorgeous piece of music that makes you feel like you're inside a music box. "Le single bleu" is a spacious and calm track, like a sonic reflecting pool, performed only by electric piano and trumpet. A gentle sort of sorrow is the main feeling of "La mort du loup", with some very restrained guitar and synth accompaniment for an electric piano melody. Electric piano and drums and some other keyboard instrument pick up the pace a bit with the jazzy and dramatic but somewhat childlike "L'ours musicien". "Creation du monde" is a long (more than ten minutes) piece with sedately movie blocks of sound on synthesizers gradually shifting from one to another as smoothly as clouds. Finally there's the resolute "La mer recommenée", which is mostly synth textures with some percussion support at the end. It somehow conveys the impression of dreaminess and solidity at the same time. This record is really great, one of my favorites. If you're in the right kind of mood, it's devastating.